It’s a scenario that plays out countless times when Dr. Rik Wyatt takes his dog out in public. Whether it’s a walk around the neighborhood or a trip to the office, all attention is immediately drawn to Huck, a 120-pound Great Dane. Although Huck is striking with his gold eyes and blue merle coat, it’s his size that gets everyone asking questions and the southern-raised and -educated veterinarian is thrilled at their interest. Giant-breed dogs are a rare sight among the dozens of toy breeds we see nestled in the crooks of their owners’ arms. Extra-tall and extra-large, they also share a long, storied history with humans that make them extraordinary. All giant-breed dogs share ancestry with the extinct Molosser – an ancient breed that first appeared centuries ago in Eastern Europe. They spread across the world and became the roots for breeds such as the Saint Bernard, Boerboel, English Mastiff, Newfoundland and Great Dane. These dogs once fought in the Colosseum of ancient Rome, battled alongside Persian soldiers, protected homesteads on the African plains from lions and hunted bears in the forests of North America. Their descendants carry the same unwavering loyalty and drive into their roles as livestock guardians, search and rescue operatives and (of course) giant couch potatoes. With their devoted nature and even temperaments, these special dogs have made excellent transitions to everyday companions. Their unconditional affection and love rightfully earns them the nickname Gentle Giant. In general, extra-large breed dogs show a great amount of patience that makes them highly trainable. The American Kennel Club categorizes the majority of these dogs into the “Working Group,” and praises them for their courage, calmness and willingness to learn. This makes them suitable for rural life, where breeds like the Great Pyrenees can be trained to guard livestock on a farm, and family life, where the Saint Bernard is renowned for its playfulness and protectiveness of children. Most giant breeds require minimal, but regular exercise, and tend to rest for large portions of the day which makes them candidates for apartment living. Bringing one of these behemoth babies into your home, however, can present huge hurdles. Their size should always be taken into consideration, especially if there are young children in the home. These dogs have no idea they are big and one swipe of their paw can be enough to injure a small child. Minor annoyances like leash-pulling and chewing are much more problematic than with smaller dogs, so proper and consistent training is critical. Giant dogs also hit hard on the pocketbook. Essentials, such as food and medical expenses, can be two to three times higher than average. These dogs are prone to a slew of health issues because their massive weight puts stress on their joints. Hip and elbow dysplasia, arthritis and degenerative joint disease are commonplace. 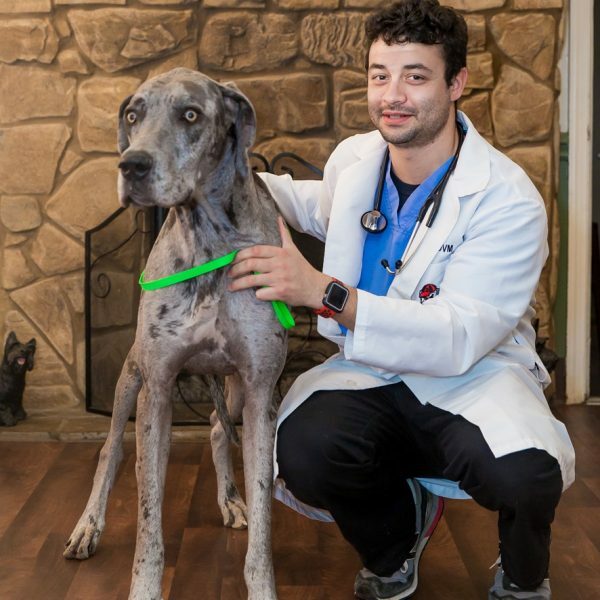 Other health concerns like bloat and certain cancers seem to occur in higher numbers among these giant pets. Routine check-ups with a veterinarian can help detect, manage and prevent these issues. The key for a long, healthy life in any dog is routine exercise and a proper diet. If you’re looking into owning an extra-large breed dog, it pays to do your research on the specific breed to learn about their personalities and possible issues and expenses. At the end of the day, having one of these amazing dogs in your life is not only a joy and a comfort, but a privilege. Goofy and playful, steadfast and faithful, giant breed dogs wiggle their way into the hearts of all they meet. The reward for having these gentle giants in your family far outweighs the negatives. Whether they are lazy cuddle bugs, or active, labor-intensive dogs, their eagerness to please and love is astounding. 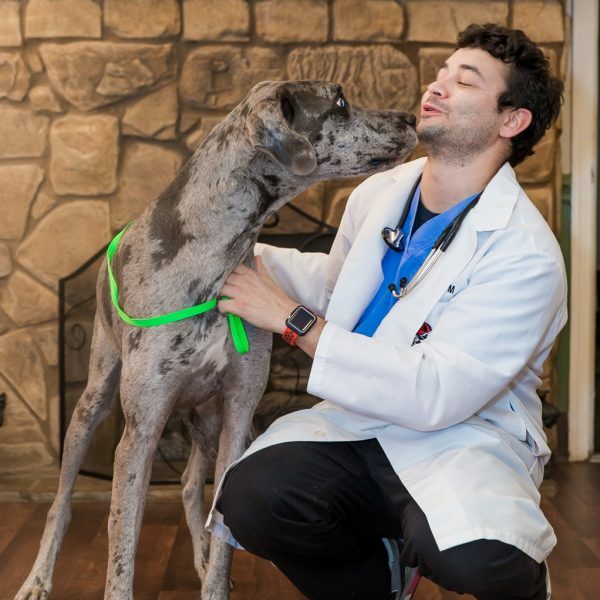 As Dr. Wyatt has learned, there will always be an air of the extraordinary when it comes to these beautiful dogs. That magic will undoubtedly inspire a new generation of giant-breed lovers, just as it did him. 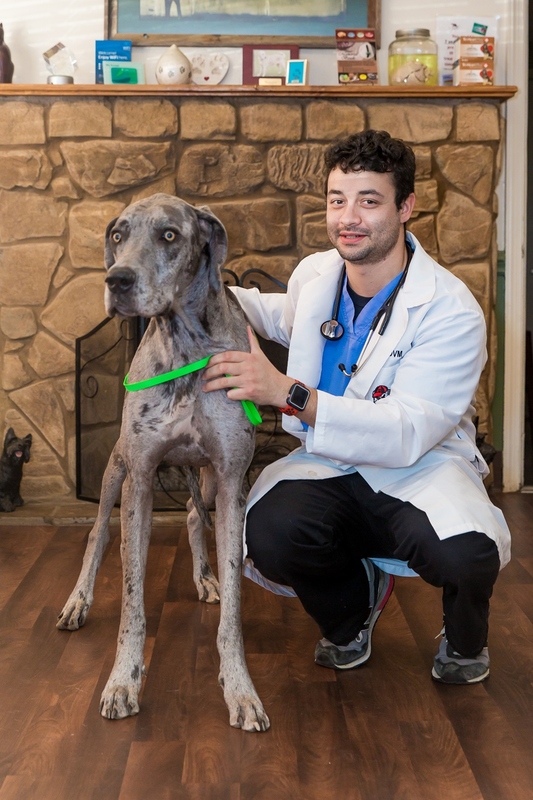 Huck is an approximately two-year-old, blue merle Great Dane who makes his home with veterinarian Rik Wyatt and fur-brother Sven, a German shepherd. After spending the beginning of his life with five other Great Danes, Huck was surrendered to a local shelter by his former owner to deescalate issues with an aggressive older dog. Huck was being treated at a sister hospital when a friend working for the SPCA tipped off Dr. Wyatt. Although shy around strangers, Huck can be personable and enjoys being loved on once settled in. 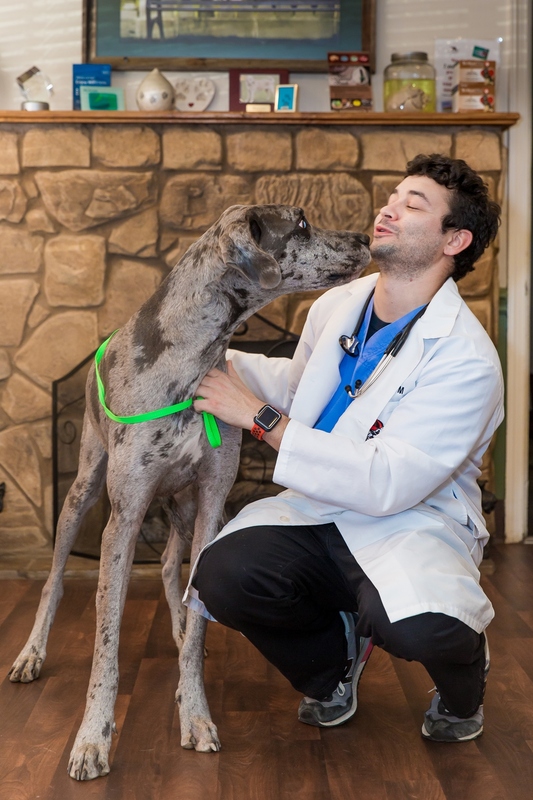 Great Danes are notoriously loyal animals and this bond is clearly present between Huck and Dr. Wyatt. Huck travels with his owner when Dr. Wyatt works in Fayetteville, having a blast playing with other dogs at doggie day care and keeping Dr. Wyatt company on the drive home. Huck’s pastimes include playing, chewing TV remotes and sitting on Sven’s head.